Dr. Mike Cvetkovic has devoted his professional life to practicing excellence in all areas of dentistry. Dentistry is a passion, and this shows in his chairside manner as well as his dental work. Dr. Cvetkovic has been creating beautiful smiles as a local dentist for thirty two years. 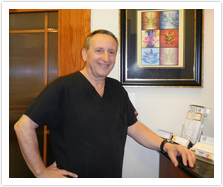 Dr. Mike Cvetkovic has been practicing dentistry in the western suburbs for the past 30 plus years. He is proficient in all phases of treatment and loves the variety that family dentistry provides him. Dr. Cvetkovic keeps updated with new trends in dentistry by continuously sharpening his skills and knowledge through professional continuing education courses and attending dental conventions. Through his caring manner, he provides comprehensive treatment to both children and adults. Dr. Cvetkovic resides nearby with his wife and two daughters. All four are graduates of the University of Illinois. Go Illini! He loves to travel to warm tropical places and is an avid scuba diver, windsurfer and sailor. Ask him about his favorite destinations!